While I maintain the previous year's 2-parter about Scully's genetically engineered baby represents what was bad about X-Files, this is a perfect example of the show at its best. Whimsical, darkly humorous, and fun, this was a fantastic episode which works as a standalone. It's better if you've seen a few other episodes of the show, but it's really not required. This one opens with Scully joining Mulder outside a cliche haunted house on Christmas Eve. The two immediately start sniping at each other like a married couple. The dialogue is witty and clever and sets up the premise quickly: long ago, two young lovers killed themselves here and, according to legend, their ghosts still haunt the mansion every Christmas Eve. Scully dismisses the story and is ready to take off. Unfortunately, she can't find her keys. 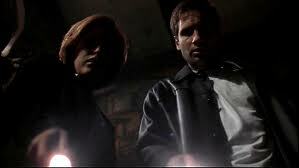 Reluctantly, she follows Mulder inside, and they begin investigating. Things escalate quickly, and they soon uncover two decomposed bodies that bear an eerie resemblance to themselves. Before long, the house separates them, and they encounter a bizarre elderly couple (Ed Asner and Lily Tomlin), who are of course the ghosts, now aged. Asner and Tomlin are clearly the stars here, and they perform brilliantly. Their characters are a lot of fun and a bit more complicated than your typical monsters-of-the-week. This is highly recommended, even if you're not a fan of the show. This is a self-contained Christmas story - and the holiday does permeate the feel of the piece - that's worthy of an annual viewing. Plus, it's available on Netflix and Amazon Prime, so it shouldn't cost many people a cent.